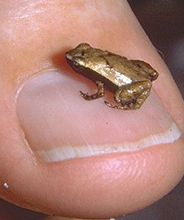 This family of small frogs is comprised of two genera, Sechellophryne and Sooglossus. Members of this family are generalized small- to medium-sized frogs that are endemic to the Seychelles and most closely related to the family Nasikabatrachidae, making them a primitive group of frogs. These two families are some of the only members of Neobatrachia to display inguinal amplexus (a primitive form of amplexus). Sooglossids are secretive frogs that hide in leaf litter and rock crevices. Generally, they are not active on the surface except during rains. Each species has a distinctive call. Females of Sooglossus sechellensis and Sechellophryne gardineri display parental care. Both direct and larval development occur in this family. Sooglossids possess tarsal sesamoid bones.